Two different accounts of the shooting of a militant leader near Burns, Ore., have been posted online. Some fear the accounts could stir more activists to travel to the town in protest. On Wednesday, authorities arrested three more people after establishing checkpoints in and around the refuge. Each man turned himself in. 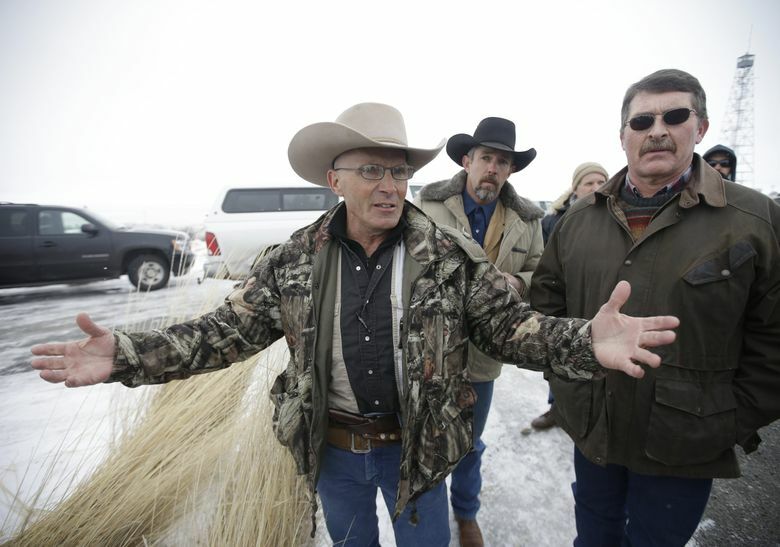 BURNS, Ore. — Among the militant leaders who laid claim to the Malheur National Wildlife Refuge, Robert “LaVoy” Finicum had emerged as a folksy spokesman for their cause. His frequent interviews with reporters could shift from talking longingly about his family to defiant declarations of his loyalty to the armed occupation that sought to gain local control for federal lands. Finicum, 55, was shot and killed Tuesday when law-enforcement officials sought to pull his vehicle and a second one over on an eastern Oregon highway north of here. Occupation leader Ammon Bundy and four other people were arrested. Two other protesters were arrested in Burns and another in Arizona. These events marked a dramatic turn to the refuge occupation, which authorities hope is nearing an end. 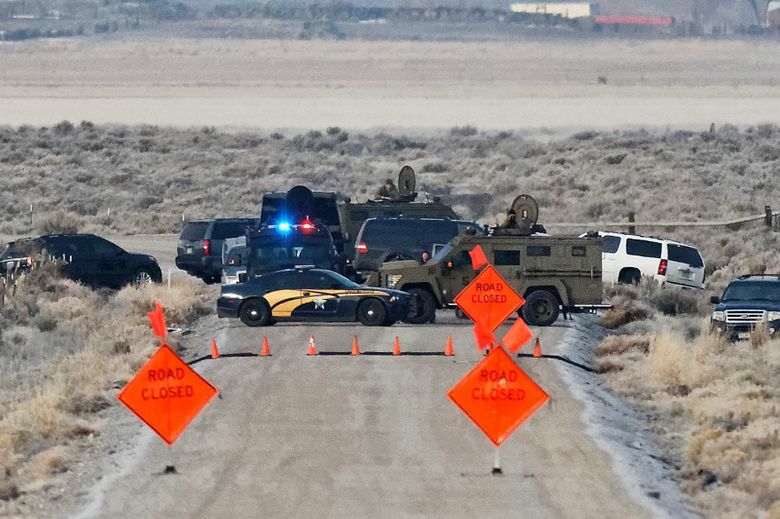 Some people left the refuge Tuesday after the arrests, while eight of the remaining holdouts left Wednesday, including three who were arrested after authorities established checkpoints around the refuge. Meanwhile, Finicum’s death quickly created a new martyr for a movement that is bound together through extensive use of social media. Already, two conflicting witness accounts of the shooting posted online are being used by activists to shape the narrative of Finicum’s final moments as one of a hero who died for his cause. One witness said he was shot by officers while he had his hands in the air. Another said he charged at officers. The online chatter raises concerns that more militants may be stirred to travel to the beleaguered community of Burns, where many are hoping to move past the occupation and return to more normal times. B.J. Soper, a founder of the Pacific Patriot Network, has urged people to “stand down” until more is known about Finicum’s death. But he worries that may not happen. “I think that people are going to converge on Burns demanding answers. I hope it remains peaceful,” said Soper, who has been in the town throughout the occupation and says he acts as a “buffer” between law enforcement and those who took over the refuge on Jan. 2. Law-enforcement officials, at a news conference Wednesday, offered no details about how the shooting occurred. Harney County Sheriff Dave Ward described the traffic stop as an attempt to peacefully end the occupation and said that the militants turned it into a violent encounter. “It didn’t have to happen. We all make choices in life; sometimes those choices go badly, ” Ward said. Also on Wednesday, law enforcement officials set up checkpoints along roads around the refuge, and urged those who remained to leave. 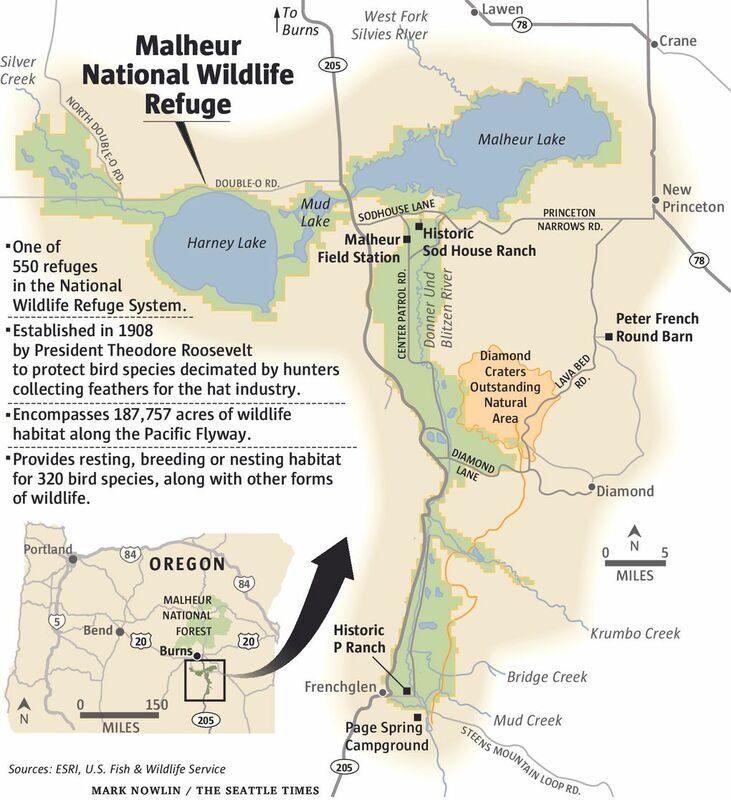 Oregon Public Broadcasting reporter John Sepulva, who spent the early-morning hours Wednesday near the refuge entrance, described a tense situation with militants fortifying defenses. After his arrest, Bundy, through his lawyer, issued a statement calling on the refuge protesters to leave. “To those remaining at the refuge, I love you. Please stand down. Go home and hug your families. This fight is ours for now in the courts. Please go home,” the statement said. From the onset of the refuge takeover, occupiers freely moved in and out of the headquarters complex to attend meetings in local communities or — in one instance — make a run to McDonald’s. On Tuesday, the leaders of the occupiers still believed that such movement was possible as they got into two vehicles to travel to John Day, a town about 70 miles north on U.S. Highway 395. They were scheduled to speak to a community gathering to explain their occupation and grievances against the federal government. Instead, federal and state law-enforcement officers pulled over the vehicles. What happened next is recounted in the two online postings. One is a YouTube video by Mark McConnell, who says he was in the second car that was pulled over. The other is an audio recording of an interview with 18-year old Victoria Sharp, who says she was a passenger in the car driven by Finicum. Both Sharp and McConnell say that after both cars were initially stopped, Finicum and his passengers sped away, tried to drive around a roadblock and got stuck in a snow bank. “Any time someone takes off with a vehicle away from law enforcement after they’ve exercised a stop, it’s typically considered an act of aggression, and foolish,” McConnell said in his video. McConnell said he did not see the shooting but discussed it with others who were in Finicum’s car. He said Finicum “charged out of the truck” to confront the officers. But Sharp’s audio tape, in which she says Finicum was shot with his hands in the air, has received more attention. Sharp came to the refuge from Kansas as part of her family’s choir, which sang a mix of patriotic and religious songs at a refuge event last Saturday. On Tuesday, she was traveling to John Day to perform again. She said that when Finicum was first pulled over, he insisted — before driving away — that he be allowed to speak to the county sheriff. Then, after his vehicle got stuck, he got out and walked toward law-enforcement officials with his hands in the air. After the incident, Sharp was released in Burns, according to Erin Maupin, a Harney County rancher who said she drove the woman to an undisclosed location in another state. Mark Pitcavage, a senior fellow at the Anti-Defamation League’s Center on Extremism, notes that McConnell’s YouTube posting had been viewed about 10,000 times by Wednesday afternoon while Sharp’s audio had been heard nearly 18,000 times. Bundy and his brother, Ryan, who also was arrested Tuesday, are the sons of Nevada rancher Cliven Bundy, who was involved in a high-profile 2014 standoff with the government over grazing rights. The group at the refuge, which has included people from as far away as Michigan, calls itself Citizens for Constitutional Freedom. It came to the frozen high desert of eastern Oregon to decry what it calls onerous federal land restrictions and to object to the prison sentences of two local ranchers convicted of setting fires. Material from The Associated Press is included in this report. Hal Bernton: 206-464-2581 or hbernton@seattletimes.comSeattle Times reporter Mike Carter also contributed to this report.